Things are heating up at both ends of the Premier League table, as the games begin to come thick and fast heading into the business end of the season. 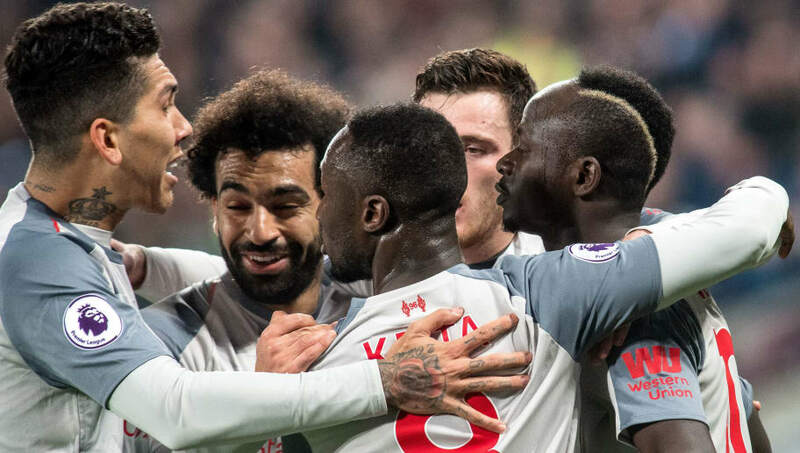 Liverpool's reign at the top of the league has been brought to a temporary halt by Pep Guardiola's Manchester City, with the Citizens midweek success over Everton catapulting them back above their title rivals on goal difference. Things may be tightening up in real life, but there is no doubting that hundreds of thousands of fans have their eyes very firmly on a different prize - their respective fantasy football titles. With that in mind, it's time to fix up and focus as we run you through who's hot and who's not ahead of the weekend action. Ben Foster: They say goalkeepers get better with age, and that is certainly true in Foster's case. The 36-year-old continues to go from strength to strength in the Watford goal, convincing over 330,000 fantasy players that he deserves a place in their squad. Hard to argue you really, given that he has kept six clean sheets and earned bonus points in two out of the last three weeks. Rui Patricio: Wolves are in a purple patch of form right now, even though they rode their luck against Shrewsbury in the FA Cup Fourth Round. Patricio has been a revelation at Molineux, and a recent clean sheet against West Ham took him up to six for the season - no doubt pleasing the 8.7% of fantasy managers who have the Portuguese in their squad. Newcastle await this weekend, so another clean sheet is not out of the realms of possibility. Alisson: ​Liverpool's confidence has taken a knock and after back-to-back 1-1 draws against Leicester and West Ham, they have been knocked off their table topping perch by Manchester City. Perhaps too soon to panic and take Alisson out of your side you would think - but the fantasy statistics indicate otherwise. The Brazilian keeper is the most transferred out stopper of the week - even though Bournemouth await at Anfield this weekend. Do you join them is the question? Matt Doherty: It was only a couple of weeks ago that Wolves' flying full-back was nominated for this category - and wouldn't you know, he's continued to his hot streak to earn yet another nomination. Up to three goals and five assists in the league this season, Doherty threw in a couple of goals in the FA Cup against Shrewsbury to further enhance his attacking reputation. He's the most transferred in defender of the week...need we say more? Jose Holebas: Also reappearing in the hot category after a relatively short spell away is Watford left-back Holebas. The Greek has continued his fine run of form, helping his side keep a clean sheet against Brighton last weekend. It's his threat going forward that rewards you most though, with the majority of his 86 point haul coming from his excellent set-piece deliveries. 14% of fantasy managers have him now, and you should seriously consider him too. Lucas Digne: When Everton are good, they are very good. But when Everton are bad, they are invariably very bad. The same can be said for Digne, who amongst two high scoring weeks that yielded 29 points, has contributed a paltry one point in his last six appearances - including three negative point weeks in the last eight. At this stage of the season, defensive liabilities are a no-no, and that record suggests it time to wave goodbye to the former Barcelona star. ​N'Golo Kante: A change or role this season at Chelsea has given Kante fresh impetus to get forward, allowing him to score more points at this stage of the season than he ever has before. Two assists last time out against Huddersfield has aided his cause, and takes him up to four assists for the season. Crucially, he costs just £5.0m and is guaranteed to start every week. Yes, Man City do await this weekend - but the bigger picture is a whole lot brighter for the World Cup winner. ​Sadio Mane: If Mohamed Salah doesn't get you, Roberto Firmino will. And if for some reason, he doesn't get you either - Sadio Mane will. And that's exactly what the Senegalese forward had demonstrated in his last three league outings, finding the back of the net on each occasion. Mane looks to be in tip-top shape, and don't be surprised if he helps spring Liverpool's title challenge back into life this weekend against Bournemouth. ​Leroy Sane: Manchester City, like Everton, really can be the heart of fantasy nightmares. Just when you thought a double gameweek could provide you with bumper Sane points, the German was promptly dropped against Arsenal and played only 59 minutes against Everton on Wednesday. Worse still, City don't have a game next week thanks to the Carabao Cup final. Taxi for Sane? Raul Jimenez: The Wolves love-in continues with a third Wanderers player making the cut this week - but again, the stats don't lie. Jimenez has nine goals and seven assists to his name now, and his recent form has seen over 170,000 fantasy managers bring him in this week. Not bad for a £6.7m rated striker. Fernando Llorente: All we have heard over the last year is how ​Tottenham will be in desperate trouble if Harry Kane picks up an injury. That notion can perhaps be put to bed for the moment though, with the emergence of Llorente as a more than credible alternative. The veteran Spaniard has played at the top level for all of his career, so it should come as little surprise that he has delivered 16 points in his last two games. Troy Deeney: Watford are performing well this season, but the goals just aren't flowing for Deeney. At least not in the volume that he might hope. Without a goal in his last four games, confidence is no doubt low heading into the weekend clash with Everton. As a result, his popularity among managers is dropping and he's now owned by less than 5% of fantasy bosses.